Before the excavation of the site of Khirbet Qumran, ceramics experts tentatively dated the jars to the late Second Temple Period, based upon their association with other objects from Cave 1 such as scrolls or lamps which could be more securely dated on paleographic or typological grounds. It was during Professor de Vaux’s first season of excavation at Khirbet Qumran that this dating was irrefutably confirmed, when a complete exemplar of this type of vessel was located embedded up to its collar in the floor of locus no. 2, in close association with coins from the early first century CE (cf. fig. 3, KhQ 17). At least nineteen examples were found at Kh. Qumran itself. In the subsequent excavations of Qumran and its nearby caves, numerous jars and lids were discovered. Several factors including (1) the abundance of the jars, (2) their unique form, (3) their general similarity in appearance, (4) their presence only at Kh. Qumran and in the nearby caves, and (5) the presence of jar fragments in the site’s pottery kiln, led to an initial conclusion that the jars had been manufactured at the site of Kh. Qumran itself. However, other factors must be considered. As much as there are general features which unite the corpus of jars as a unique pottery form, there is also a remarkable diversity of features within the corpus. De Vaux listed eleven jar types and twenty-three lid types deduced from the numerous jars found during the cave survey of March 1952. The additional jar types found in scroll caves 1, 4, 7-8, and 11 must be added to de Vaux’s initial typology. One should also not discount the suggestion that there was a wider distribution of the jars than the limited sphere of Qumran and its surrounding caves alone. 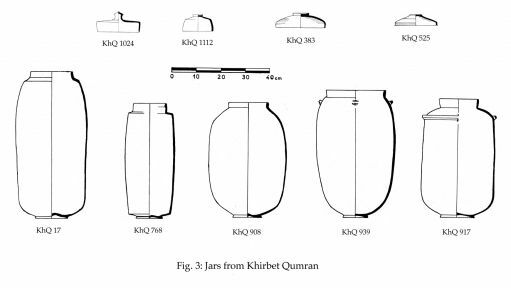 Other sites from which examples of such jars have been published are Jericho (Tulul el-‘Alayiq), Tel el-Ful, Quailba, and likely other sites in, or on the periphery of, the Judaean wilderness. The lids which are generally associated with these jars have been identified among the ceramics from Jerusalem, Ramat Rachel, Bethany, and Beth Zur. The practice of storing documents in jars was not limited to Qumran. There are several references in ancient literature to scrolls which were stored or hidden in jars. A Greek Psalms scroll found in a jar “near Jericho” was used by Origin for one of the columns of the Psalms in his Hexapla. The world of archaeology beyond the land of Israel has also provided a few examples of scrolls or codices sealed in jars. The Nag Hammadi Codices were hidden in jars secreted in the clefts of the rocks. Two jars for which details have been published came from the Ptolemaic Period at Deir el-Medineh in Egypt. At 39 cm in height, both were considerably shorter than the forms from the Qumran caves. One was found covered by a bowl (Suppl. 6121) and the other was covered by a plate; both ‘lids’ were affixed to the jars’ handles with straps (cf. Fig. 5). They contained numerous papyrus scrolls written in Demotic and Greek, dating between 171 and 104 BCE. 1. An interior height sufficient to cover the tallest scrolls, i.e., ca. 40 cm (but not much more than that). 2. Diminutive loop or pierced handles, with holes only large enough for affixing the lid (as in the case of the Deir el-Medineh jars). The only cave in which scrolls can be said with any certainty to have been stored in these jars is Cave 1. At least three of the more-or-less complete scrolls were found in one jar, according to the report of the Bedouin. In addition, it is apparent on the basis of wear patterns, that at least some of them, including 1QS, 1QpHab, and 1QM, were protected in jars. However, it is likewise apparent that most of the more than seventy manuscripts from Cave 1 had not been protected within jars, as indicated by bat guano which covered most of them as they lay strewn on the floor of the cave. Thus, it would seem that few of the numerous jars which are known to derive from Qumran Cave 1 held scrolls at the time of their discovery. During the excavation of Cave 3, thirty-five jars (both complete and fragmentary) and twenty-six lids were recovered. However, none of the fifteen manuscripts excavated (including the Copper Scroll) were found in jars. Caves 4a and 4b, which yielded the most abundant manuscript evidence, contained only one complete jar and fragments of only three others (with three typical lids). In other caves, in which the jars were abundant, no manuscripts were at all evident. This includes Survey Cave 29, which yielded thirteen jars and sixteen lids, and Survey Cave 39, with ten jars and nine lids. The first exemplar of a ‘scroll jar’ found in situ at Khirbet Qumran was found embedded in the floor up to its collar—hardly a logical place for the safe storage of scrolls. In at least two other cases (loci 13 and 34), the jars were set in the ground with their bottoms broken out. Thus, although the jars were known to contain scrolls in certain cases (viz., certain of those from Cave 1 and possibly Cave 11), it is apparent that these jars were also used for other purposes. 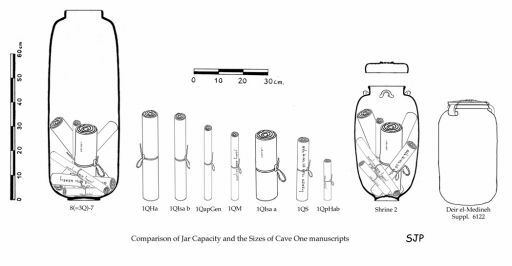 The so-called ‘scroll jars’ from the Qumran Caves range between 46.5 cm (DJD III, Fig. 2.4) and 75.5 cm (DJD III, Fig. 2.1) in interior height. Of the more than 150 jars estimated by de Vaux as having derived from the caves of Qumran, only forty-seven have been registered. Twenty-three of these are complete. The jars, as a rule, are far too tall and wide to have been purposely designed to house scrolls, as the following table illustrates. As can be seen from the table, the Thanksgiving Scroll (1QHa) was the tallest. Yet even this, the tallest of the scrolls from the caves of Qumran (c. 36.5 cm, cut from a cowhide), is dwarfed by the shortest jar of this type from the caves (46.5 cm; a difference of 10 cm, or more than one-fourth the height of the scroll). Shrine 2, the one jar from the Qumran caves that most closely approximates the form and size of the noted manuscript jars from Egypt, would have had the capacity to contain all seven scrolls from Cave 1, with room to spare. Needless to say, other jars which are taller and wider, particularly at the base, would dwarf even the tallest scrolls. The unsuitability of the large cylindrical jars is illustrated in Fig. 5 in jar Q8(3Q)-7, where even medium-sized scrolls would have toppled and lain in a pile with other scrolls at the bottom of the jar. For contrast, each of the seven scrolls has been positioned in Shrine 2 in this illustration to reflect the actual orientation and contact points of each scroll in the jar based on the damage patterns evident on the scroll itself.